We covered the rules about running Facebook Competitions in our last blog post. Now here’s how to make them brilliant – in 7 easy steps. Getting wider reach on Facebook is great, but it’s even better when it’s aligned with your marketing objectives too. Don’t just chase the vanity metrics – chase the ones that count. Lots of Facebook Competitions offer high value items like iPads as a prize. But can you be a bit smarter about it? There’s no point reaching a thousand people who want an iPad if they’re never going to be interested in your business. Think – what does your target customer *really* want? Can you offer that as a prize? 3. Create compelling graphics, images, and text. 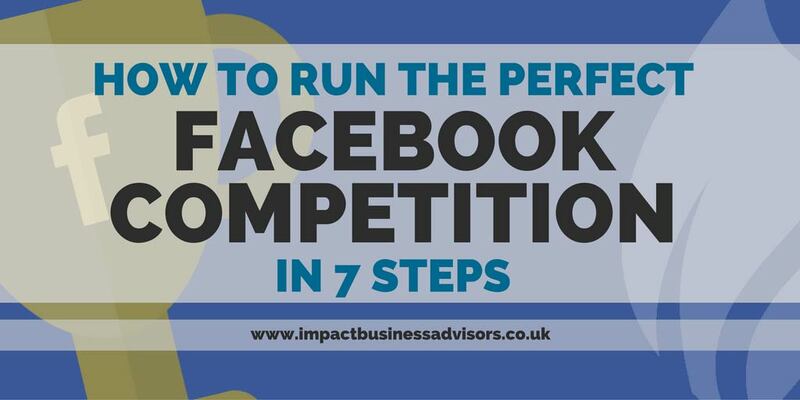 Fairly standard, this one – it’s just as important to spend some time creating good quality graphics, and engaging copy, in a Facebook Competition as it is in any other type of content. 4. Make sure your graphics, images, and text, are suitable for Facebook ad requirements. Because we’re going to promote the Competition using Facebook ads, design your post with this in mind. So, keep your text in the image to under 20% of the total image space. 5. Seed your post with some targeted ad spend. At the moment you launch your Competition, add some (minimal) ad spend to your post, and fire it at a targeted audience. Once you’re getting good traction on the post, up your ad spend incrementally to push the post even further. Standard social media etiquette – have conversations, speak to people, make a connection. It all helps. Don’t just rely on Facebook to do all the hard work. Link to your Competition on Twitter / LinkedIn / Snapchat (want to know how?? Check out this awesome hack) / Instagram / blog / email signature / newsletter, etc. etc. You don’t have to do this alone – we can do the hard work for you, and get your business up and running at full steam online. Plus – and this is the good bit – we’re GIVING AWAY free 30 minute one-on-one workshops to get you started. Limited spaces are available, so request your session NOW. Just click above to get started. All of these rules are correct as of August 2016 – though do be aware that Facebook can change the rules at any time. Here’s the link to Facebook’s Page Guidelines to find out more. David has worked with countless UK charities, businesses, and schools - with a brilliant track record of helping them with their biggest challenges. David is the founder of the Impact group - including Impact Charity Advisors, Impact Business Advisors, and Impact Education Support.